Published in Rafu Shimpo, July 27, 1967. 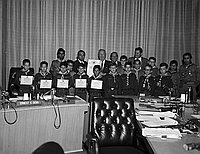 Los Angeles Supervisor Ernest Debs presents "International Friendship Day" proclamation to Boy Scouts, Los Angeles, California, July 27, 1967. 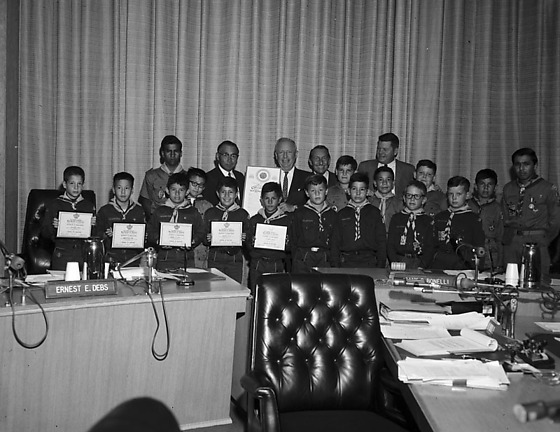 Includes Debs, a white-haired Caucasian man dressed in dark suit and patterned necktie, and El Camino Boy Scouts of America chairman James Nakagawa, a Japanese man in eyeglasses and suit, holding proclamation behind a desk with deskplate, "Ernest E. Debs", and microphones (Published) ; and Debs standing with Nakagawa holding proclamation and two Caucasian men, amongst a multi-ethnic group of seven boy scouts and nine cubs scouts, five of whom hold certificates at left. Curtains in background. Typed on orignal envelope: Boy Scout Receiving Proclamation from Supervisor Debs. Ernest E. Debs was a Supervisor for the Third District of the County of Los Angeles.